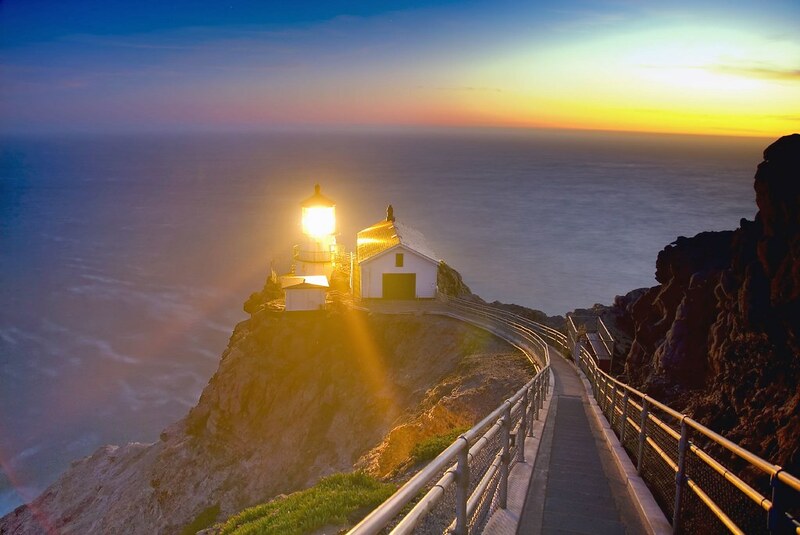 Point Reyes Lighthouse, photo by Harold Davis. View this image larger. 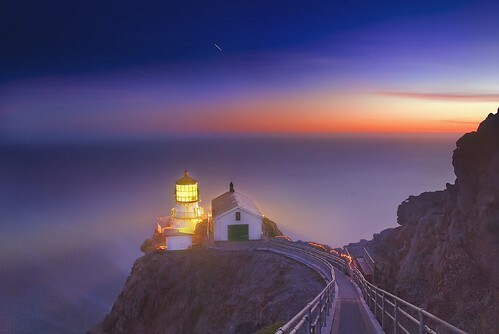 Here’s another version of the Point Reyes Lighthouse after sunset, this one a thirty second exposure that shows the lighthouse beacon. 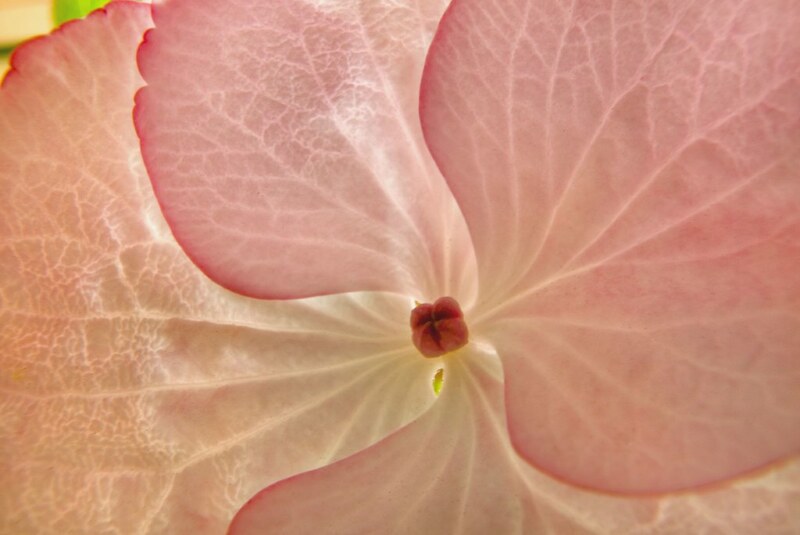 Hydrangea Sheila, photo by Harold Davis. View this image larger. This is a photo of a designer Hydrangea, Hydrangea Sheila, one of the so-called “Dutch Ladies”	created by Dutch plantsman Daan ver der Spek. Julian and I picked out the plant, and as usually happens, I photographed it before committing it to our garden. The close-up of this hydrangea is unusual because it is a macro taken with a wide-angle lens, my new Nikkor 12-24mm. I added a 12mm extension tube between the lens and the camera. Then I set the lens to the 24mm maximum focal length. I turned off automatic focusing, and set the lens to infinity. I stopped the lens down as far as possible, to f/22, for maximal depth-of-field, and let aperture-preferred metering take care of the exposure time (13 seconds). Focusing was a matter of moving plant and camera until things were right, essentially until the flower was almost touching the lens. It was a little humorous to see the blossom hidden within the lens shade. To help with this focusing process, I used a magnifying eye piece. I also put the camera on a focusing rail, so that I could ratchet the camera in and out with precision (mostly in, as close to the flower as it would go). Related story: Night of the Hydrangea. Tamalpais from Mission Peak, photo by Harold Davis. View this image larger. 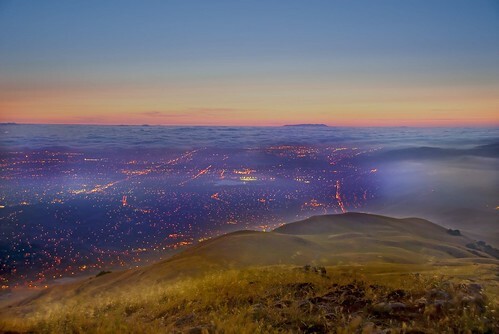 This view looks north from the summit of Mission Peak. Mission Boulevard points in a straight line towards Mount Tamalpais, which sticks out of the fog bank like an island in the sea of clouds. Return of the Drama Queen, photo by Harold Davis. View this image larger. 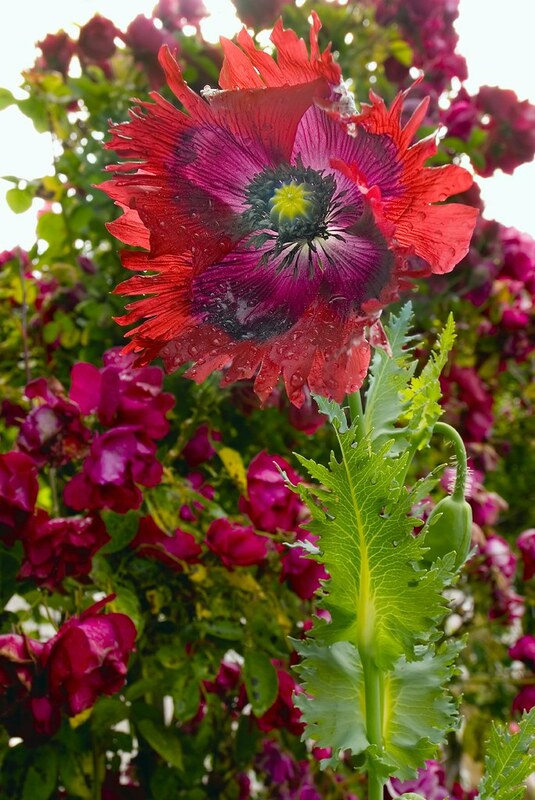 This is a Drama Queen Poppy, Papaver somniferum, that reseeded itself in my garden. I bought the original Drama Queen from Annie’s Annuals, and photographed the flowers last year. Early this morning, the sun was glowing through this gigantic and colorful poppy, with a wall of climbing roses behind it. I photographed the Drama Queen up close and personal with my camera on tripod using my new 12-24mm Nikkor (18-36mm in 35mm terms). This wide angle lens fills a gap in my “portfolio of optics,” falling between the 18mm lower end of my standard lenses (27mm in 35mm terms) and my 10.5mm digital fisheye, which shows obvious curvature. So its great to be able to get up close to a subject with this wide angle lens, like this in-your-face Drama Queen, and still be able to show background. The lens seems to be quite sharp, and I am enjoying learning its characteristics. Above the Urban Sprawl, photo by Harold Davis. View this image larger. This photo from the summit of Mission Peak looks north past Hayward up the San Francisco Bay. Depending on how you look at it, my life is pretty insular or serene. It takes a vista like this to remind me how many people there are around here, hustling and bustling in their busy lives. Related story: Improv on Mission Peak. 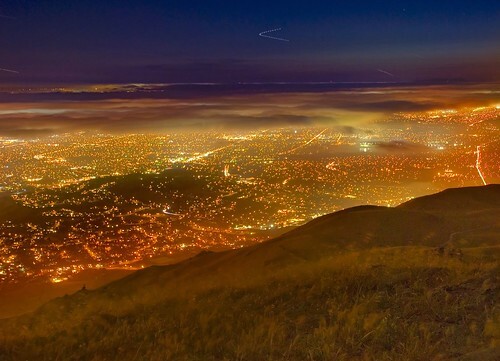 Diablo from Mission Peak, photo by Harold Davis. View this image larger. Jack invited me on a hike up Mission Peak, along with his friend Eric. The plan was to meet in the late afternoon for an early supper, then get to the top of Mission Peak in plenty of time for sunset, staying until it was dark so I could photograph the landscape at night. Mission Peak was a new destination for me. It rises from the East Bay hills, more-or-less to the east of Fremont. The trailhead has an amazing feel to it. There are quandrangle after quandrangle of gated McMansions, and you park right near some of these structures with their faux porticos and feel of conspicuous tastelessness. But right away when you start up the trail there is nothing around you but the empty spaces of the California hills, at this time of year golden brown and ascetic. In the distance the world bustles: if you know where to look you can pick out the Google campus, Palo Alto, and much more. It’s hard to miss the acres of shining new cars for sale in the Automall far below. I imagine I have a good twenty years on Jack, who in any case seems to do triathalons before breakfast. So I tried not to feel patronized when he expressed concern about whether I was in shape for the hike, and later at the summit when he gave me a “Good job” like I do with Julian, my nine-year-old, when he finishes a hike that is tough for him. But going back to the starting moments of this adventure, when I opened the trunk of my car to put on my hiking boots and grab my camera pack, I found I had left my tripod at home. I’d been rushing to get alot of things done before the hike, and then wanted to beat the Friday rush hour down I580 to south bay. As I’d backed out the garage, I’d had this nagging feeling that I’d forgotten something, but, alas, I had dismissed the feeling. So I wasn’t going to bag the hike, and home was too long a drive to go and get my tripod. You need a way to keep a camera steady to take long exposures at night. What was I going to do? Part of being a good photographer is being willing to improvise, to look for creative solutions, even when the materials at hand aren’t perfect. On top of Mission Peak there’s an old, hollow pipe that sticks about a foot out of the ground. I was able to plant my camera in the top of this pipe. Using a bunch of small rocks, I could pretty much get stable time exposures in all directions. Admittedly without the flexibility and precision of my tripod, but still, it worked. The photo above is a thirty second exposure showing Mount Diablo, Pleasanton, I680, and a fog bank sweeping across the hills. The photo below is a cropped detail showing the upper San Francisco Bay beneath a cloud bank, with “the peninsula” behind. The summit of Mission Peak is truly a grand view in all directions, and I’ll be posting more photos as I post-process them. I’m sure I’ll also be going back. Up there, you get this weird feeling of aloneness. You are witnessing suburban sprawl and the intense hum of human activity in Silicon Valley. But you are witnessing it as an eagle might, high above it all. Coming down at about 11PM, the trail seemed endless. We passed a California King Snake on the trail, who seemed more awake and alert than we were. Then it was back among the McMansions in the cubicle world, and drive drive drive up the endless freeway until I reached home with my family fast asleep. My five-year-old son Nicky likes to ask me, “When is a door not a door?” Before I can answer, he tells me, “When it’s a jar,” and cackles wildly. In the same general spirit, I’d like to ask, when is a photograph not a photograph? My answer, and imagine me cackling wildly, is that a photograph is not just a photograph when it is a digital photograph. How can this be? Literally, to photograph means to write with light. Off hand, we should be just as able to “write with light” whether the resulting images are saved to digital media or saved using silver halide chemistry. 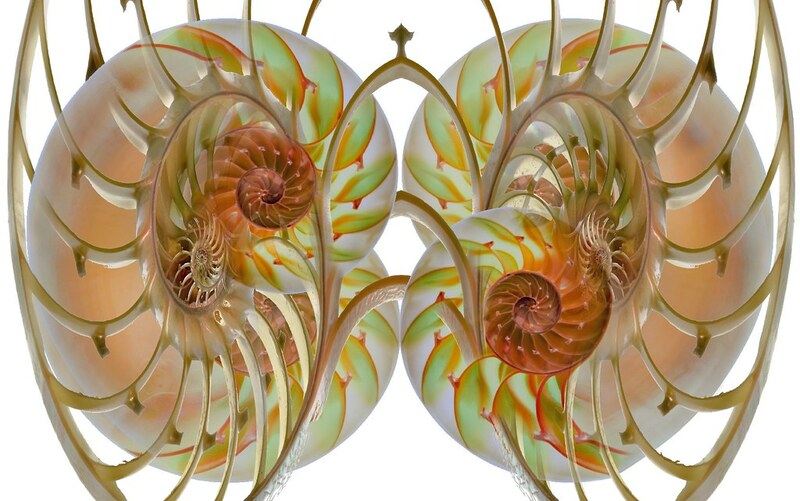 Each of the three images that illustrates this story depicts some kind of spiral. 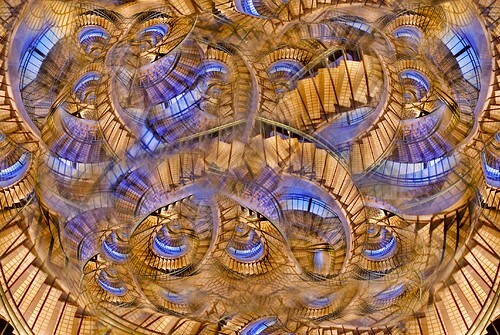 Each was created as a photo composite. 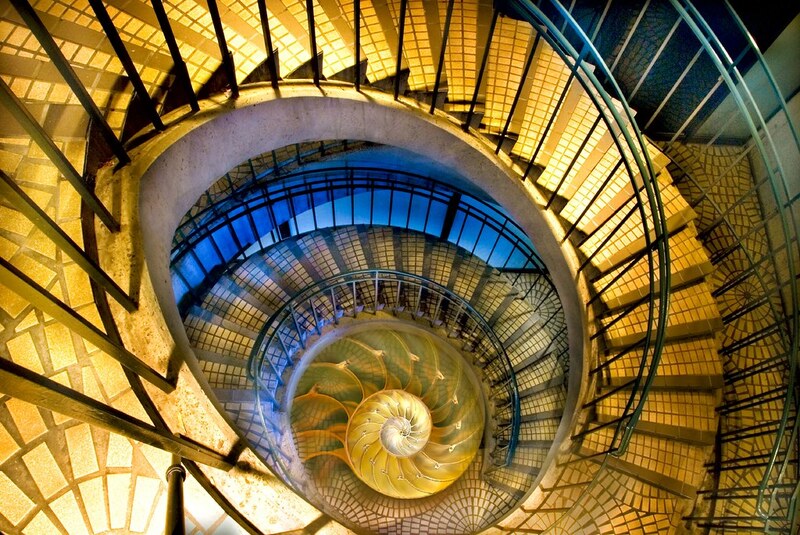 The top image places a photo of a nautilus shell inside a photo of a spiral stair. The middle image combines several views of a nautilus shell with each other. 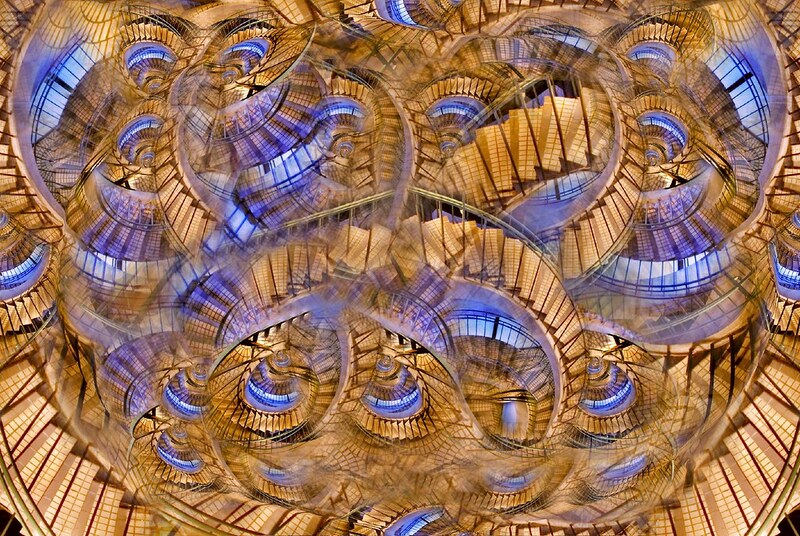 The bottom image creates a dream (or nightmare) of one staircase contorted together with itself at different scales in an impossible way. The general technique for photo compositing in Photoshop is to place the distinct images on separate layers, then use layer masks and blending modes to combine the layers. My own practice of compositing seems to often involve combining rotated or resized versions of the original photo, creating a kind of regression or recursion effect, as I explain in World without End. OK, so most people recognize that a Photoshop photo composition is adding the element of composition, or collage, to straight in-camera photography. In fact, some purists don’t like Photoshopped photos for this reason. It can also be pointed out that it was certainly possible, if labor intensive, to create photo compositions using pre-digital technology (as a case in point, the great compositions of Jerry Uelsmann come to mind). But an important point that seems forgotten is that every digital photograph has been post-processed. This post-processing may involve aggressive Photoshop work (or even as in the illustrations here the creation of entirely new composites). Or it may be the digital camera, that single-purpose computer with a lens and a scanner attached, automatically processes the scanner input into a file made up of pixels that it can save and display. My own experience is that I spend far more time post-processing a photo than I do taking the photo in the first place. This is true for me even when the image doesn’t involve photo composition. Of course, if you are a production photographer processing (for example) hundreds of wedding photographs, you don’t have the luxury of this time. But I suspect that most serious photographers spend the couple of hours per image that I do in post-processing. In which case, how much of the resulting image is Photoshop and how much is photograph? In fact, whether the post-process is under the control of the photographer, or whether the photographer is even aware of the post-processing, it does happen for every digital photo. In this sense, digital photography adds a whole new step to photography (I hate to use the overused “paradigm”, but it probably applies). It is no longer just photography, it is digitally post-processed photography. And the greatest transformation of photography since photography was invented. Imperfect Rose, photo by Harold Davis. View this image larger. This is an imperfect rose. Like all living things, it comes with imperfections as part of the package. 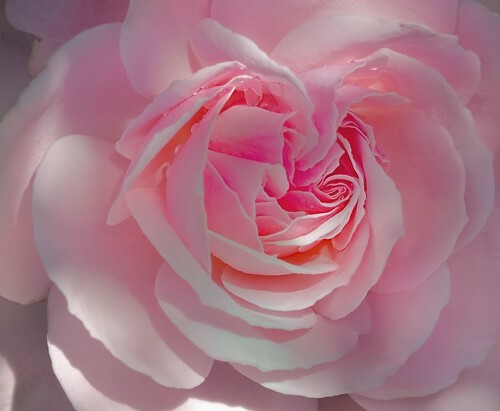 Still, when I saw this imperfect rose glowing in the sunshine in my garden, with the single small water drop in its center, I felt the rose was perfect. And I had to photograph it. 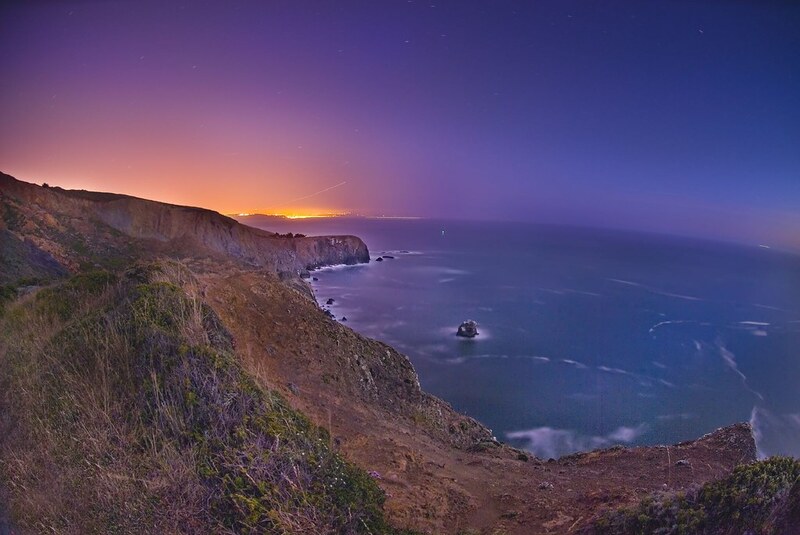 Star Light Star Bright, photo by Harold Davis. View this image larger. Above the lake, you can see the ridge line descending to the ledge where I took some of the earlier photos in this series. If you look closely at the lake itself, you can see the stars reflected in its extremely still waters. 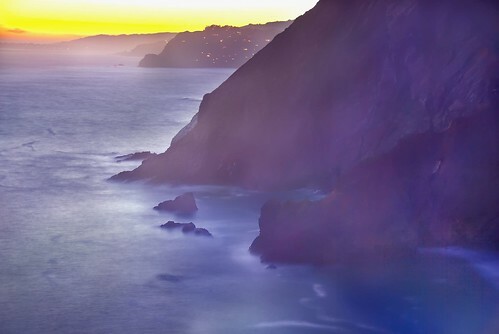 In this sequence: Marin Coast Sunset; Tennessee Valley at Night; Tennessee Beach Sunset; City Lights. For more info about night photography: Digital Darkness; On Night Photography. City Lights, photo by Harold Davis. View this image larger. 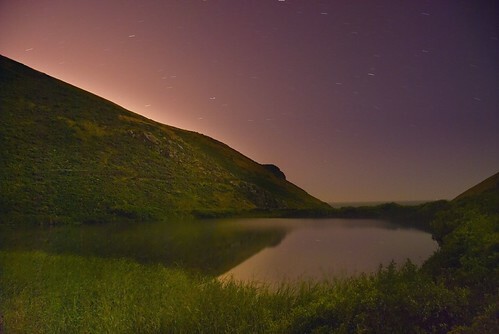 This is a long exposure (120 seconds) with my 10.5mm digital fisheye lens photographed into night. Standing on my aerie, I pointed the camera in the opposite direction from Tennessee Beach Sunset. In the photo, you are looking south. You can see the cliffs of the Marin Headlands, then the gap made by the Golden Gate, followed by the lights of south San Francisco. Airplanes and a ship have turned into trails of light due to the time exposure. As I’ve said before, I think there is something very eerie about standing on an aerie in the dark wilderness photographing the lights of the city. Tennessee Beach Sunset, photo by Harold Davis. View this image larger. This is a long (four minute) exposure, as you can tell by the trails the stars make and the way the surf has turned “solid.” With the shutter open for four minutes I could catch the last light of the sunset. Indeed, the photograph reveals more colors than I could see standing there. Who would guess this was almost total night? And where was I standing? Here’s a bit of the story. Tennessee Valley at Night, photo by Harold Davis. View this image larger. Coming off the cliffs by Tennesse Beach in full night, I found the homeward trail still and serene. So still that I could make this 5 1/2 minute exposure and still capture detail in the grass as lit by starlight and the crescent moon. 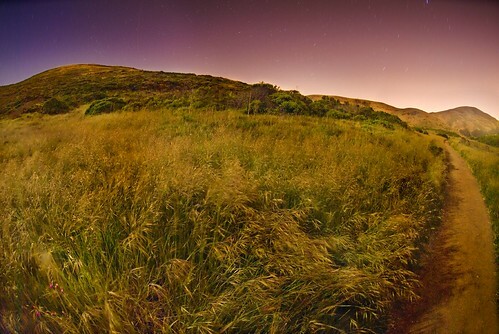 For this image, I used my Nikon D200 with my 10.5mm digital fisheye at ISO 100, 330 seconds and f/3.5 (wide open). Related stories: Night for Day; Digital Darkness; On Night Photography. Marin Coast Sunset, photo by Harold Davis. View this image larger. This is a thirty second time exposure with my lens wide open. I caught the last light of sunset. I was on an aerie, a grassy platform, high above Tennessee Beach looking north. 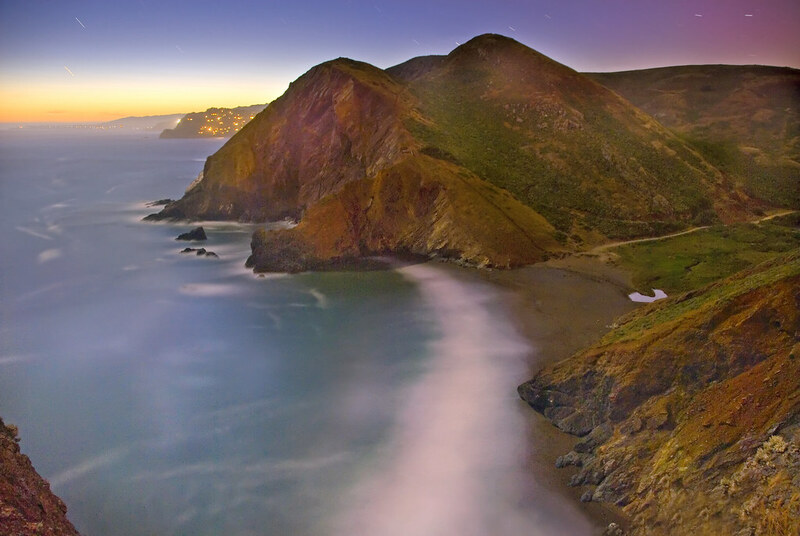 You can see a little bit of Tennessee Beach in the lower right of the photo, the massive cliffs to the north of Tennessee Beach, then the lights of Muir Beach, followed off in the distance if you look hard by the lights of Stinson Beach. Here’s a fisheye photo taken from the same vertiginous spot in daytime. Speaking of vertiginous, I’m not inclined to vertigo, but this is a pretty dramatic location with a long drop to the pounding surf. Once true night was upon me, I had to remind myself that I was well equipped with a headlamp and good hiking boots. The path that goes up to the spot can’t exactly be called a trail, but at least it is a path. The path was lit by the crescent moon and bright starlight, although a little fog was wafting in. I knew that as long as I stayed on the path I’d be fine. Still, things don’t look the same at night. It can be particularly difficult to accurately gauge distances. There’s a natural physiological danger response (at least for me) in this kind of situation when I am alone at night high up a cliff above pounding surf. I willed myself to calmness. As I started down, I glanced at a gully to my left. A pair of bright, luminous eyes were staring up at me. Probably a raccoon or bobcat. There was no way down the gully to investigate. Over the constant sound of the surf, I could hear the occasional toll of a warning buoy. Back down on Tennessee Beach, I felt more relaxed. I meandered up the short, easy trail to the parking lot, dawdling on the way to capture the landscape by moon and starlight. And, yes, more photos will follow. 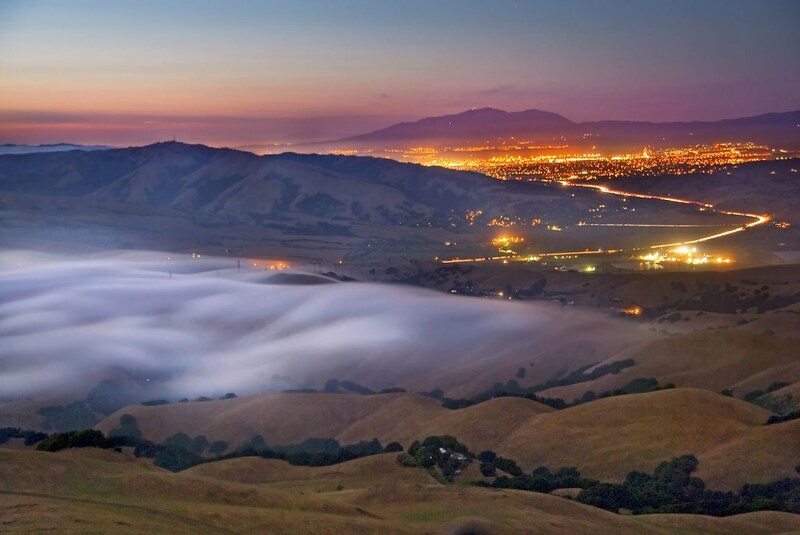 Mount Tamalpais, photo by Harold Davis. View this image larger. With the shutter open for five minutes, my sensor picks up all kinds of ambient light on the slopes of Mount Tamalpais. 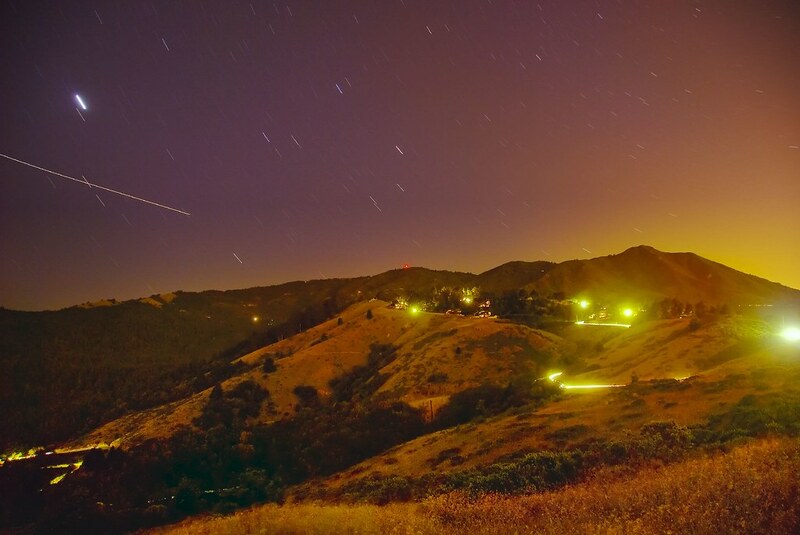 Cars snaking their way up and down Panoramic Highway, houses on the ridge leading up to the peak, a red light on the summit, and the glow of ambient light from Mill Valley and other Marin cities reflecting on the mountain. How different the landscape looks under the daytime sun. Related stories: Mount Tamalpais from Euclid Avenue; Maserati and Mount Diablo; Digital Darkness; On Night Photography.